Kingdom of Persis. Vahshir, 1st century BC. Silver hemidrachm. Vahshir is also known as Oxathres in Sear Greek. 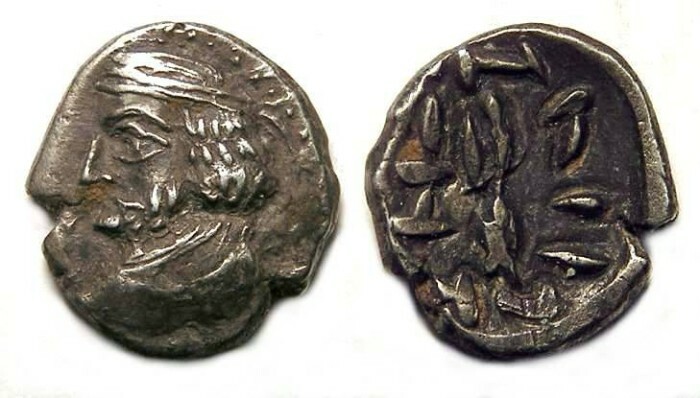 Reference: Sear-6211 but variety (obol rather than hemidrachm) , Alram-580. Size: 12.5 x 14.0 mm. Weight: 1.79 grams. Obverse: Crowned bust of Varsir left. Reverse: The King standing left before a fire altar, with inscriptions around. The reverse is very crude.